A building commemorates the diamond jubilee of the Reverend Mother Mary Conzaca Barry. Mary Gonzaga Barry I.B.V.M (1834–1915) was an Irish Catholic Religious sister whose life work led to the establishment of Loreto schools across Australia. Mary was educated by the Loreto Sisters in Ireland before entering the I.B.V.M (Institute of the Blessed Virgin Mary) in 1853, at the age of 19. In 1875, the first Loreto Sisters, led by Gonzaga Barry traveled from Ireland to Australia and at the request of the Bishop of Ballarat, agreed to establish Catholic schools for girls. Despite her initial issues, such as her age and mild deafness, these Loreto Sisters established a school in Ballarat shortly after arriving in Australia which was run by Mother Gonzaga and the I.B.V.M. This first school founded was St Mary's Mount Abbey. Mary Gonzaga Barry died on the 5th March 1915, at Loreto Abbey in Ballarat, Australia. In her obituary she was described as 'a woman of bright intellect ... [with] exceptional talent for the transaction of business affairs'. One of Mother Barry’s dreams was to build a Chapel at the Loreto Convent, Ballarat. The ceremony of turning the first sod for the new building to be erected to the memory of Rev. Mother Gonzaga was performed on Wednesday, March 25th, by the Very Rev. P. Kennelly (Adm.), assisted by the Rev. M. Mulcahy, in the absence of his Lordship the Bishop, who was away on a visitation. The nuns and boarders walked in procession from the Grotto of Lourdes, singing the Litany of Our Lady, at the termination of which Fr. Kennedy; after turning the sod, said it was not the first time in his life he had turned a sod but it was the first occasion on which he had done so in connection with a building for Loreto. He had great pleasure in performing the ceremony, and he wished the nuns every success in their noble project. The following friends contributed in aid of the funds through Mrs. Benjamin Hoare and Mrs Loughnane— Dr and Mrs A.L.Kenny, Heidelberg; Mrs. Newman, East Melbourne; Miss K. Noonan, West Melbourne. Tribune (Melbourne), 4 April 1914. 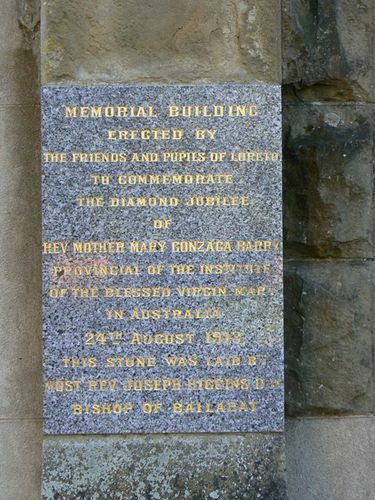 Memorial Building erected by the friends and pupils of Loreto to commemorate the Diamond Jubilee of Rev Mother Mary Conzaca Barry Provincial of the Institute of the Blessed Virgin Mary in Australia 24th August 1913.